He’s a Brazilian traitor. He’s the Spanish scapegoat. One moment he’s in a tussle with an opponent. The next he’s banging another goal in just to remind you he’s the leading scorer in the most popular league in the world. He was Atletico’s crown jewel. He’s another cog in the Chelsea machine — despite once being the missing piece to the puzzle. He’s a late bloomer who carved his own niche through an ever running motor on the pitch and a knack of being in the right place at the right time. He’s the latest in the long line of bad boy Premier League strikers whose antics made as many headlines as his performances. Brazilian born Diego Costa is a man of many hats. More importantly he’s whatever you want to spin him to be. On one hand of the spectrum, he’s the guy who constantly is getting into on the field scuffles — kicking, staring down, and infuriating opponents in a manner that leaves a bad taste in viewers’ mouths. Costa comes off like a punk with a chip on the shoulder, as someone with something to prove, with no means of actually showing their worth. His aloof nature when it comes to his actual worth on the pitch makes him seem like a child with no appreciation of his talents. And they have a good point. Costa certainly would be more respected in nearly every circle if his on the field persona was more subtle. It’s one thing for Joey Barton to make headlines for being an instigator. Barton isn’t even in the top half for talent in the Premier League, but there’s certainly no need to be a punk when you’re as good as Costa. Why can’t he let his play do the talking? He’s been worth every penny for Chelsea; does he not know what it means to play in that role? Maybe he’s not even a big enough man. That crowd has a point. Out of all the obnoxious players in an obnoxiously covered league, Diego might be the crown jewel. He even looks and plays the part. His appearance is very similar to a grumpy old man, and his game revolves around pushing around opponents like a bull in a china shop. Oh and yes, like every South American born striker, his transfer negotiations involved a third party that wasn’t much more than a greedy middle man. But he still joined the current international dynasty on a whim and was part of bringing it to it’s knees. There’s so many things about Diego Costa that read like nails on a chalkboard. There’s almost no reason to like him. He’s just another annoying soccer player who is just good enough to get attention. Until game day, where all of a sudden that guy wearing a blue shirt with the number nineteen becomes impossible to ignore for the complete opposite reason. He holds up play beautifully. He kick the ball like a cannon. He runs like a gazelle, while having the strength of a minotaur. All while poaching like a vulture. He’s the complete package. Oh and what’s that? He’s often the hardest working man on the pitch? That’s hard not to love. It’s true, the easiest guy to hate in the Premier League when it comes to everything outside of football is also the most lovable footballer in the league. Diego Costa is a perfect example of one who doesn’t know his talent. He could be one of the sports most endearing stars, but instead he exists in the shadows of being one of the larger antagonists. 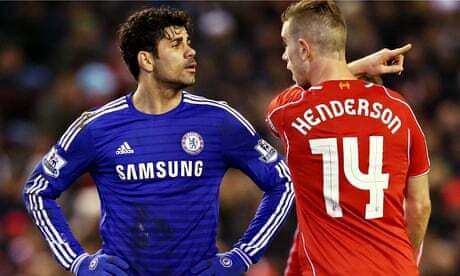 Without that two-faced existence Diego Costa wouldn’t be the player or person he is today. It’s that same fire that leads him to kicking opposing players when the ref isn’t looking that also creates that extra defensive play to get his team possession back. All the parts that make us loathe him are the ones that keep our eyes glued. He’s the definition of polarizing, as just his being splits out opinions of him. He’s infuriating. He’s a beautiful player. He’s the guy who just dusted up with Jordan Henderson in the tunnel. He’s also the guy who is leading the way to Chelsea’s potentially successful trophy hunt. He’s Diego Costa, and whether you choose to love him or hate him you certainly will never be able to ignore him. 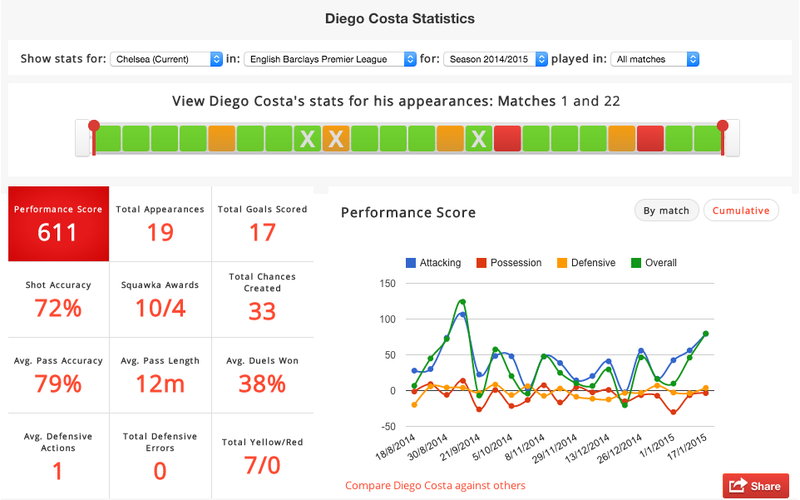 This entry was posted in English Premier League and tagged Chelsea, Diego Costa, Premier League. Bookmark the permalink.